Members on the forum have recently reported problems with the CVT transmission and this thread will be dedicated to reporting these problems, what the dealerships are saying, and how the shuddering can be fixed. Unfortunately, the transmission jerking/shuddering problem has been ongoing in the Nissan Pathfinder and owners have been lodging complaints about it since 2013. There’s actually around 59 reports regarding the issue on CarComplaints since then, but Nissan has not issued a recall for the CVT transmission. According to the National highway Traffic Safety Administration (NHTSA), a recall is necessary when a vehicle or a part of the vehicle does not comply with a Federal Motor Vehicle Safety Standard or when there is a safety related defect. We do not know if the CVT shuddering/jerking falls into either of these categories, but the dealerships themselves may have a solution without the need of a recall. Super moderator jman’s Pathfinder shuddered a bit and it was fixed with a replacement valve body. If Nissan cannot fix the problem no matter what they do and the shuddering and jerking transmissions is becoming a safety hazard, owners can report the safety problem to the NHTSA if there is no recourse. There’s no guarantee that a recall will result from their investigation, but the NHTSA will have the problem on file. You forgot to mention that another recourse is to force Nissan to buy back the defective vehicle under the lemon-law statute in the owner's jurisdiction. Strict criteria need to be met. In the USA, the Better Business Bureau can also assist owners with mediation. Hello, Our 2013 Pathfinder is at the dealer right now because the transmission would not allow us to accelerate. The battery was also drained and power steering would go if I attempted to continue on for a few minutes. This diagnostic software update will enhance the dealer?s ability to better diagnose and service the CVT by including two new Diagnostic Trouble Codes (DTCs) and enhanced active test capabilities for CONSULT-III. In addition to the installation of diagnostic software, Nissan will also extend the warranty coverage on the CVT assembly (including internal CVT components, gaskets, and seals), CVT control valve body, and torque converter from its original duration of 60 months/60,000 miles to 84 months/84,000 miles (whoever occurs first). Coverage of other vehicle components remains unchanged, and all other terms, conditions, limitations and exclusions of Nissan?s New Vehicle Limited Warranty continue to apply. This CVT warranty extension is being provided as a customer satisfaction effort to address customer concerns; including those concerns expressed by the plaintiffs in class action litigation, and is subject to final approval of the settlement of that litigation. Prior to final approval, Nissan will make any necessary repairs that would be covered under the extended CVT warranty. Dealers should install the updated CVT software in vehicles identified in Service Comm with I.D. PC500. No additional diagnosis or repair is required unless the customer indicated they have concerns about CVT operation during the interview process. It should take approximately 1 hour to reprogram the Continually Variable Transmission (?CVT?) software. Anyone have experience with this issue and/or recall? Can you please share the source of that information? I was the first att my dealership to get it started. No paperwork to sign BUT they did say my current work order was left open, (oil change and new tires), and I would sign it when it, the TB, came in. I was asked some pretty tricky questions so be careful how you respond. No paperwork in my mail yet either. The recall does show on their website but with NO DETAILS. PATHFINDER CVT INSPECTION NTB16-120. Customer request to perform recall PC500. Performed PC500. Retrieved DTC P17F1. Inspected CVT chains no problem found. Replaced control valve with new Nissan replacement. Refilled system with NS3. Performed write IP characteristics. Performed TCM update to new software. Adjusted CVT fluid to correct level. Test drove vehicle. Vehicle OAD at this moment. My 2014 (one of the earliest build for that model year) never really exhibited any of the classic "shudder" problem (maybe mildly once). They obviously did the update a while back to the transmission to capture the code. I never really felt it, but obviously the computer says otherwise. If you believe the worksheet, they updated the computer yet again to a "new" software. There were no mention of extending the transmission warranty to 84 month/84K miles. In fact, the service advisor just said the standard 60 month/60K miles warranty remains. Does anyone have a copy of NTB16120 or NTB16109 which they can share ??? 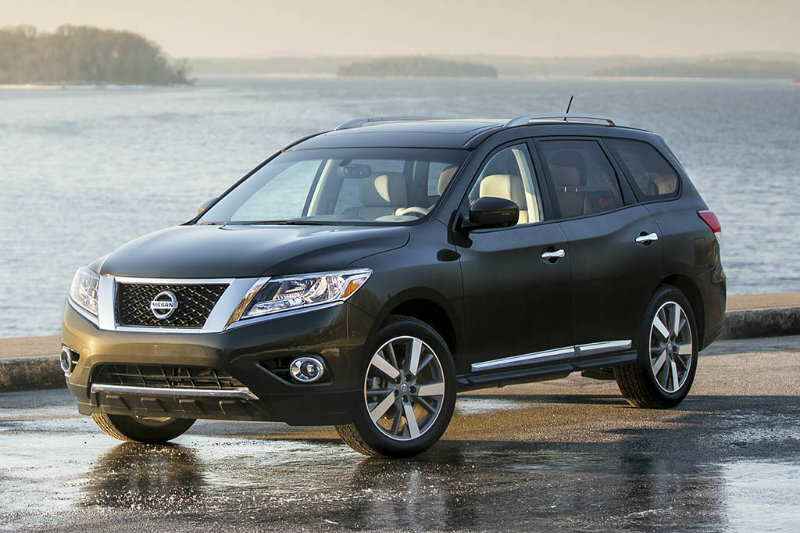 INTRODUCTION Nissan is conducting this voluntary service campaign on certain specific 2013-2014 Pathfinder vehicles to reprogram the TCM and, if needed, inspect and replace the CVT or CVT control valve. Just had the valve body replaced on mine today, feels different to drive, but i think they over inflated the tyres ! About a week ago when i took it in for the shudder i think they did NTB16109, because they were testing it out on the hoist and it was when the car was on the hoist that they were able to easily reproduce the shudder. Prior to that i couldn't reproduce it on my drive to the dealer to get it looked at. What is involved in the control valve replacement? Do they have to pull the engine and CVT to do so? It is attached to the bottom of the transmission. It is on the front side on the driver side and is easily accessible. I just had it replaced on my '15PF and was shown the part and the car on lift and was given zero explanation about what went wrong. I just bought a 2015 2 weeks ago from CarMax. Super clean and only 32,000 miles. After the first few days the shuttering started. It's been very mild and not very often. I didn't know what it was until I joined the forum. In any case I took it to CarMax and they checked it out - CVT shutter. Since I have to leave for Florida next week and my son and his family coming down here the week after, I postponed having them take it to the dealer until the end of the month. I'm told that Nissan will probably have the car for a week or so. To shorten up a long story, does anyone see an issue with a 10 hour drive (in each direction) before getting it to Nissan? Traffic lights designed for 35mph, also work for 70mph.